How Pixar’s John Lasseter dug into the cutting-room-floor scrap heap of the first Cars movie to come up with the idea for the new film. Creative people know that no idea that gets cut from a project ever goes in the trash can. It just gets tucked away for some later use. That’s what happened with the story of the new Cars 2 film, which hits movie theaters next month. 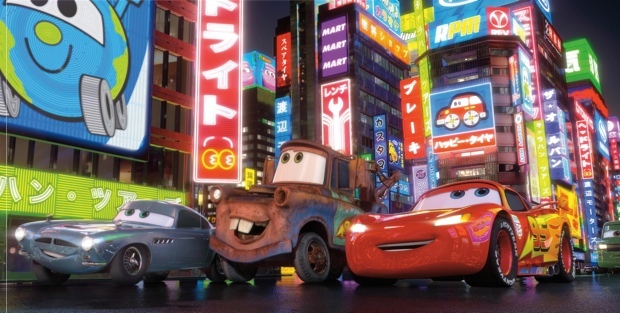 At a press event on Tuesday, John Lasseter, chief creative officer of Disney and Pixar–and the new film’s director–explained that the idea for the new plot came from a scene that ended up on the (digital) cutting room floor during the first Cars film. That first film, which came out in 2006, includes a romantic scene between hero Lightning McQueen and sweetie Sally Carrera. Initially that scene was set at a drive-in (get it–cars going out for a date at a “drive-in”?). On the screen at the drive-in, Lasseter said, was a spy movie starring a British James Bond-type car, called Finn McMissile. The Cars team eventually took that scene in a different direction, setting it on a cruise instead. But when it came to plotting Cars 2, Lasseter dusted off the drive-in film, which had been partially story-boarded as a film within the film. “I never forgot about it and always thought that would be really fun to do,” Lasseter said, adding he himself is a big spy film buff. As a kid, he said, The Man from U.N.C.L.E. was his favorite TV show. Hence the new movie: a spy story set at a series of races around the world. As Lightning McQueen, the race car hero of the first film, competes in the races, Mater, his rust-bucket, tow-truck sidekick, gets embroiled in an international espionage plot of some sort, and Finn McMissile (pictured above, right)–a sleek vehicle that looks like a cross between a Jaguar and an Aston Martin, liberally doused with 1960s British cool and brilliantly voiced by Michael Caine–comes to the rescue. The rest of the movie, Lasseter said, was inspired by the director’s own experience of traveling around the world, doing publicity for the first Cars movie. As he manuevered through foreign cities, he found hmself imagining how the characters in his film would have reacted to the various driving cultures, like driving on the wrong side of the road in England and Italy’s casual attitude toward traffic rules. The new film is set in Europe and Japan.